↑ "The Constitution of the Republic of Armenia (with amendments)". Constitutional Court of the Republic of Armenia. 5 July 1995. पहुँचतिथी 14 अक्टूबर 2012. ↑ Campbell, George L.; King, Gareth (2013). Compendium of the World's Languages (3rd संपा.). New York: Routledge. प. 115. ISBN 9781136258466. 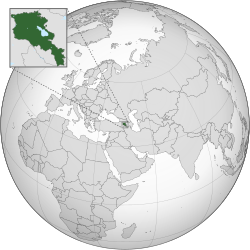 ...Eastern Armenian is the written and spoken language of the Republic of Armenia. ↑ "National Assembly of the Republic of Armenia - Official Web Site - parliament.am". ↑ Lang, David Marshall. Armenia: Cradle of Civilization. London: Allen and Unwin, 1970, p. 114. ISBN 0-04-956007-7. ↑ Redgate, Anna Elizabeth. The Armenians. Cornwall: Blackwell, 1998, pp. 16–19, 23, 25, 26 (map), 30–32, 38, 43 ISBN 0-631-22037-2. ↑ Redgate, A. E. (2000). The Armenians (Reprint संपा.). Oxford: Blackwell. प. 5. ISBN 0631220372. However, the most easily identifiable ancestors of the later Armenian nation are the Urartians. ↑ Encyclopedia Americana: Ankara to Azusa. Scholastic Library Publishing. 2005. प. 393. It was named for Artaxias, a general of Antiochus the Great, who founded the kingdom of Armenia about 190 B.C. ↑ "The World Fact Book – Armenia". Central Intelligence Agency. 19 July 2010 के ओरिजनल से पुरालेखित. पहुँचतिथी 2010-07-17. ↑ "Statistical Service of Armenia" (PDF). Armstat. पहुँचतिथी 20 फरवरी 2014. ↑ 13.0 13.1 13.2 13.3 "Armenia". International Monetary Fund. पहुँचतिथी 2013-07-19. ↑ "Distribution of family income – Gini index". The World Factbook. CIA. पहुँचतिथी 2009-09-01. ↑ "Human Development Report 2015". United Nations. 2015. पहुँचतिथी 14 दिसंबर 2015. ↑ Dum-Tragut, Jasmine (2009). Armenian: Modern Eastern Armenian. Amsterdam: John Benjamins Publishing. प. 12. ISBN 9789027238146. The orthography used in Armenia nowadays goes back to the Soviet orthography reform of 1922 and its revision of 1940.